If you want to quickly whip up a healthy snack or appetizer, try this dip from Jamie Oliver! I’m making this in honor of Food Revolution Day, and hope you’ll try it too. 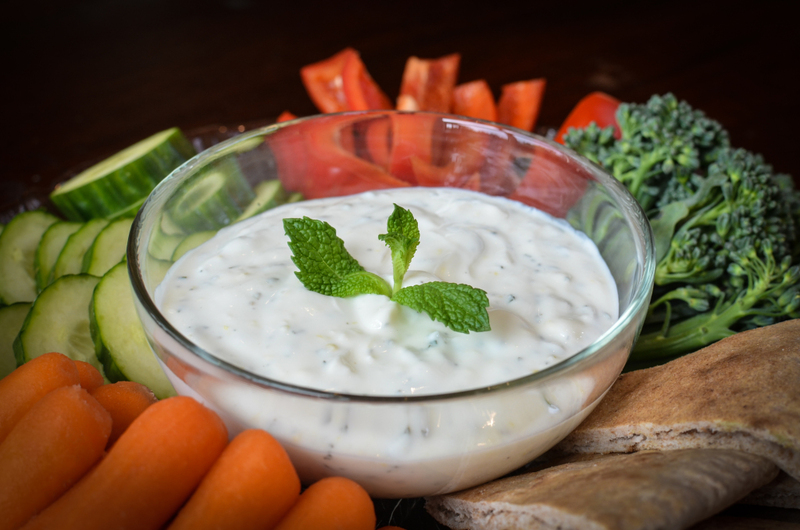 This simple, yet delicious yogurt dip is minty, lemony and garlicky! Perfect fresh dip for veggies! Pick and finely chop the mint leaves on a chopping board, discarding the stalks, then add them to a mixing bowl. Use a microplane to finely grate the zest of half a lemon onto the board, then transfer to the bowl. Squeeze the juice into a bowl, using your fingers to catch any seeds. Peel and very finely chop the garlic on a board, then scoop it up and add to the bowl. Add the yogurt and a tiny pinch of salt and pepper, then stir everything together. Have a taste and add a squeeze more lemon juice, if you think it needs it. Transfer to a serving bowl, and serve with a platter of veggies for dipping. thanks for showing jamies recipe amber i am hoping that food revolution day will be awesome, i will be cookinghealthy too.